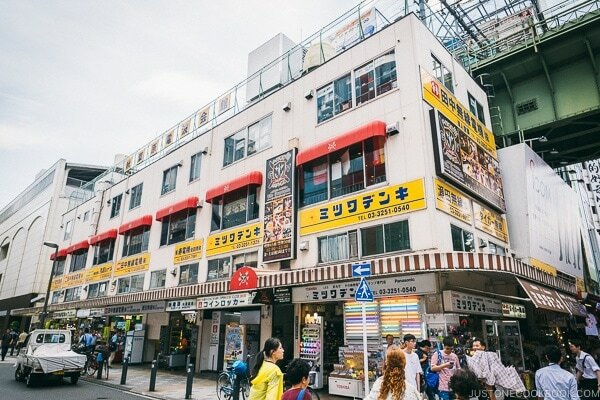 Once known as Electric Town, Akihabara is now a magnet for video games, anime, and manga hobbyists and many themed cafes. 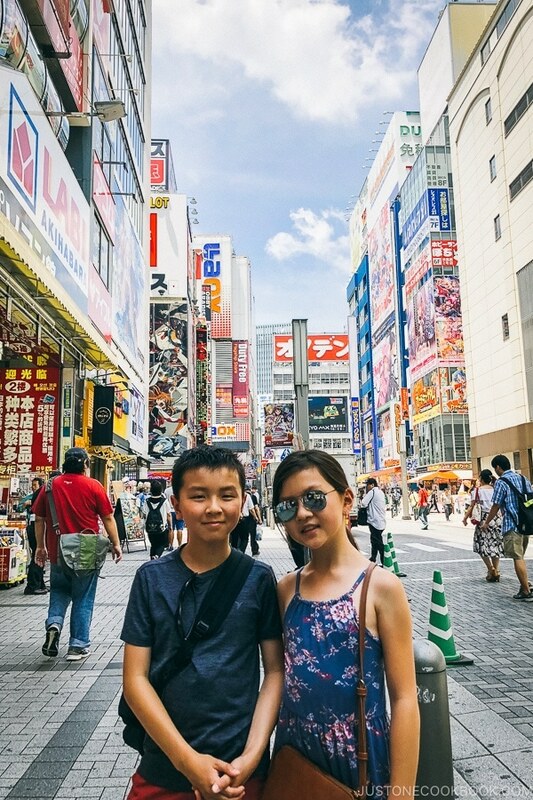 When we visited Akihabara, we had only planned to spend a short time there. Somehow between the hobby stores and the video game arcades, the hours went by quickly and we ended up spending half a day. 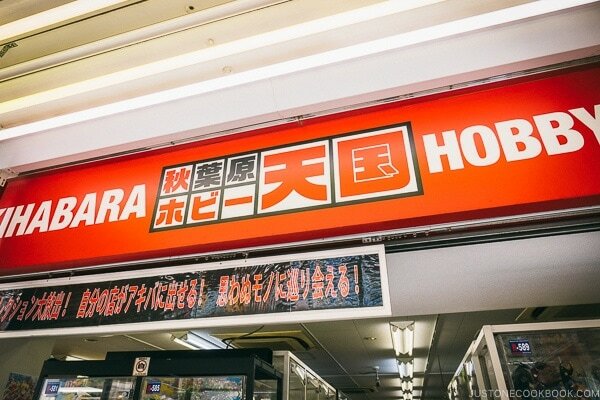 Come join us as we explore the unique hobby stores, Don Quijote megastore, and Gachapon Hall in Akihabara. 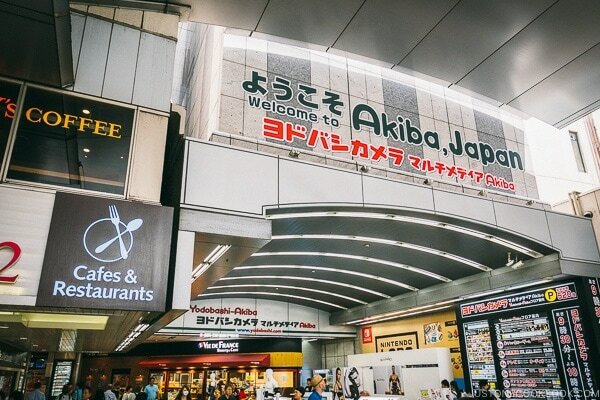 When you first exit Akihabara station, it could be difficult to orient yourself. 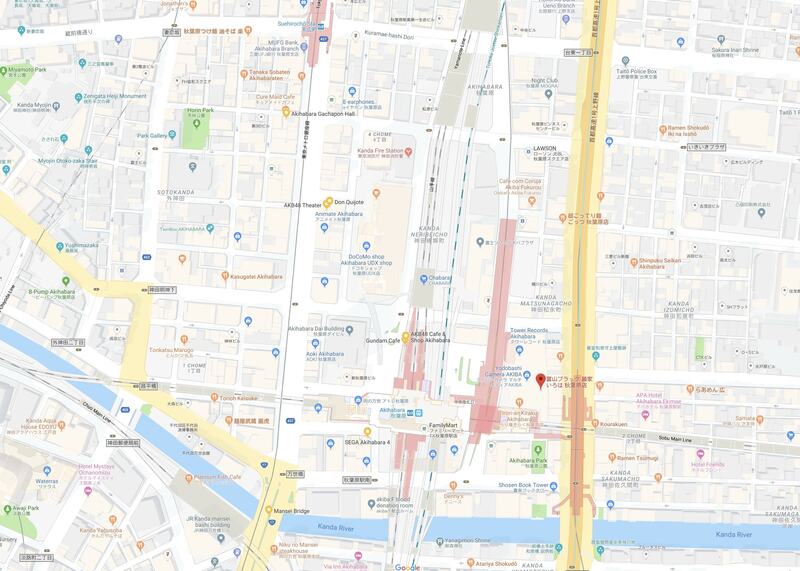 No worries, here’s a tip to find your way quickly, The main strip for Akihabara is on Chuo Dori (中央通り) to the west of the station. 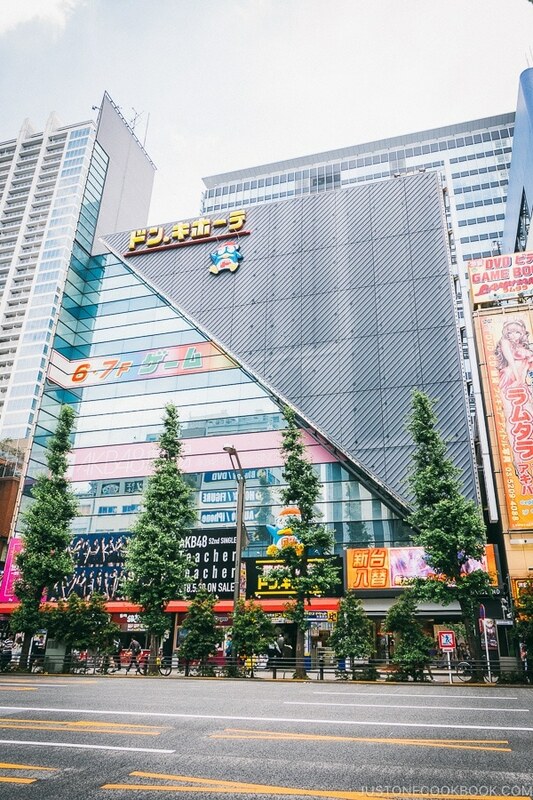 The east side of the station has the giant Yodobashi Camera store. 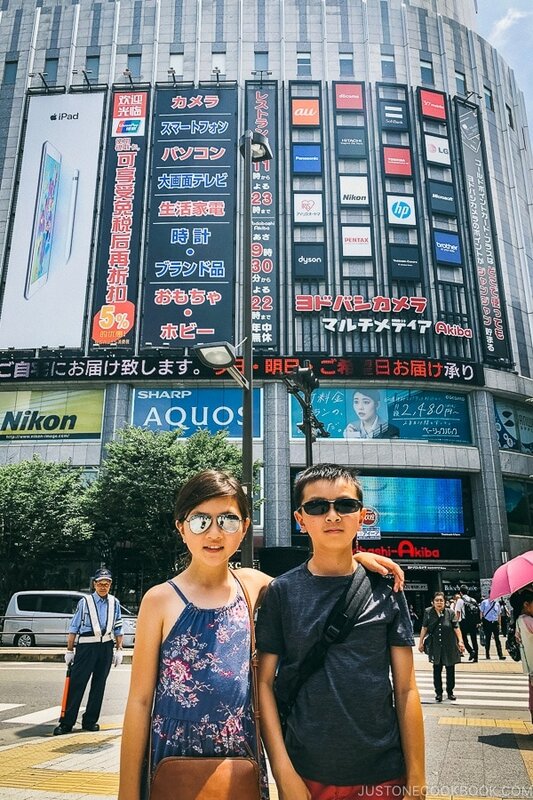 If you see the Yodobashi Camera store, head in the other direction to get to Chuo Dori. 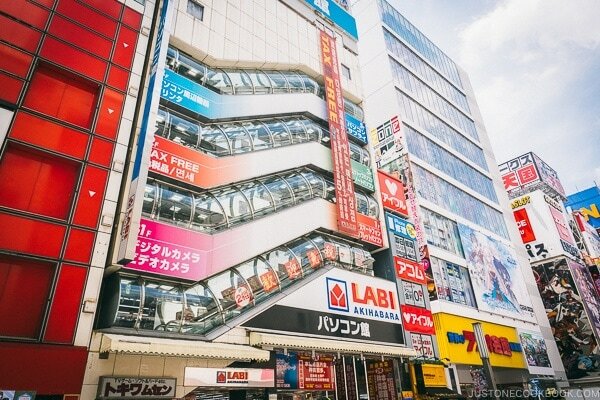 In case you’re looking for any type of consumer electronics including camera equipment, games, computers, or kitchen gadgets, Yodobashi Camera is a good bet as it’s one of the largest electronics chains in Japan. 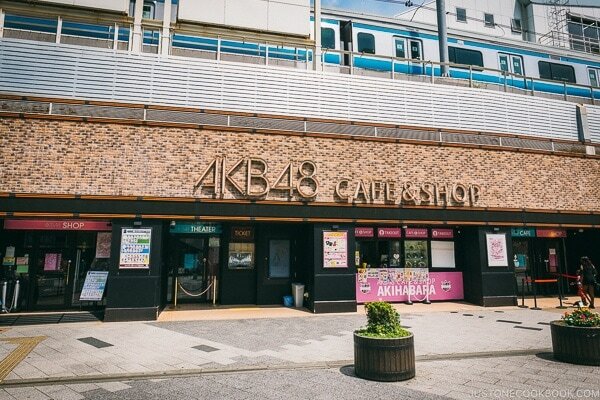 As you walk to the west side of the station, the unmistakable neon lights, see through escalators, and anime billboards of Akihabara greet you. 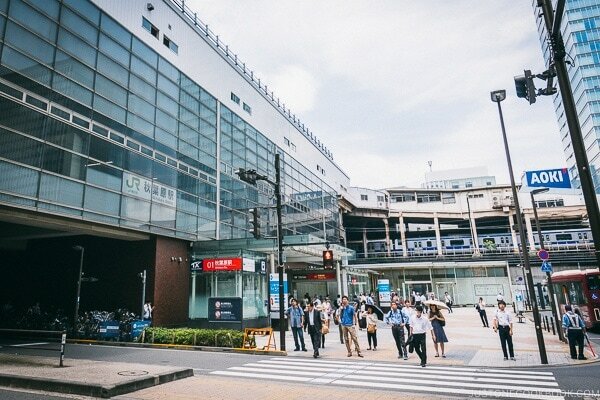 West exit of Akihara Station. In this area directly west of the station, the streets are lined with various electronics and hobby stores. 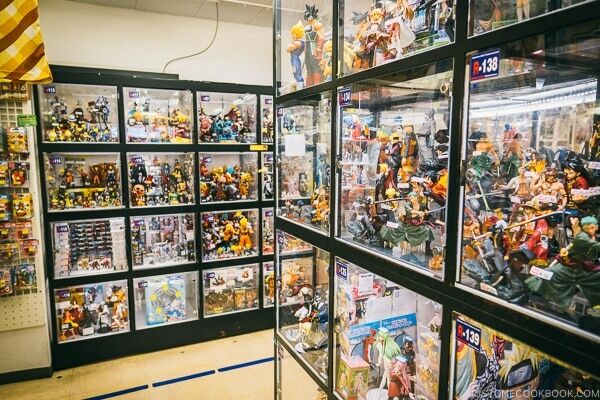 As we peek inside many of the hobby stores, they are filled with clear cases featuring various comic and anime characters. I’ll be honest, as someone who grew up in Asia and has read an obscenely large number of comic books, there’s something magical and nostalgic about all these anime characters. 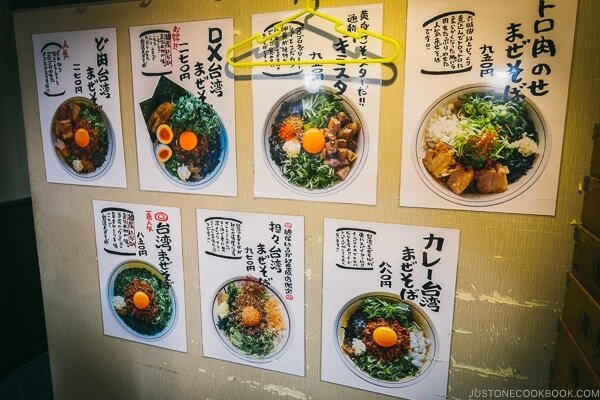 It was difficult for me to suppress the urge to take some home. There are small and large hobby stores, and the large stores like Volks Hobby Paradise had thousands of characters on display and each one was meticulously crafted with exact details. 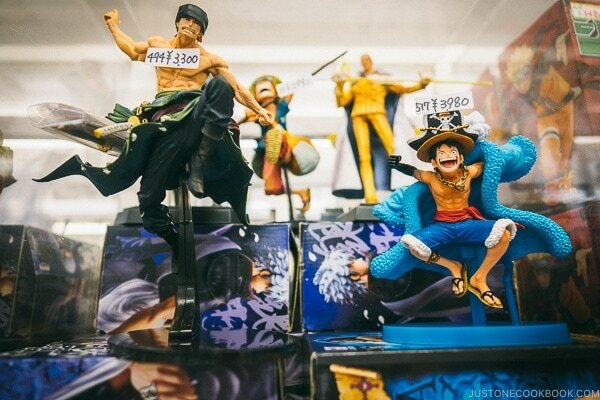 Hobby stores with anime figurines. There were characters from many anime but the most popular one by far is One Piece. 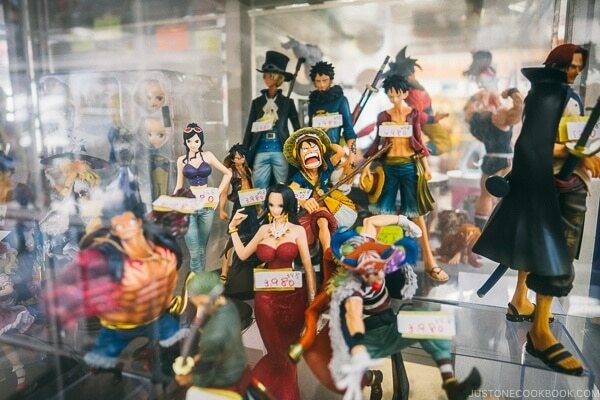 Quite a large percentage of the display cases featured One Piece characters. 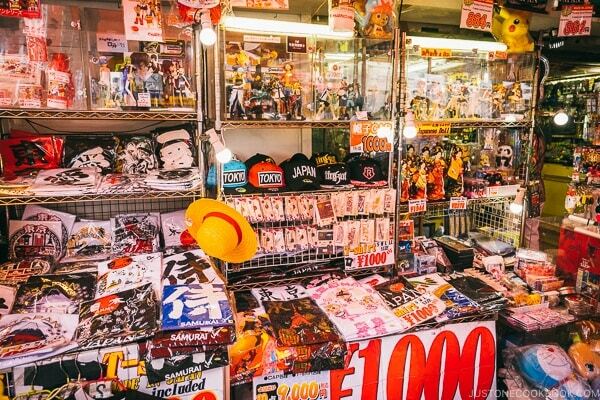 The characters ranged from the lower range of 2,000 yen all the way up to 30,000 yen+. 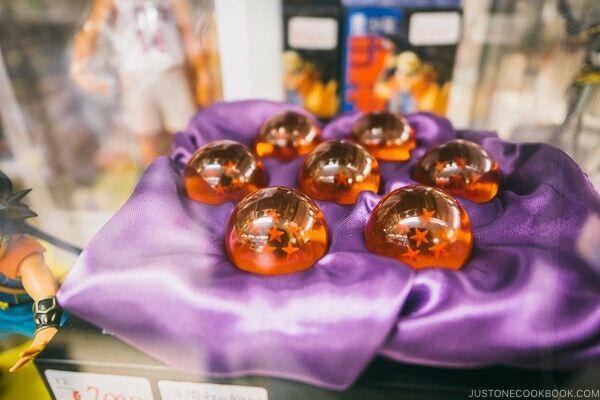 As a fan of Dragon Ball, it was difficult to resist not bringing the balls home. 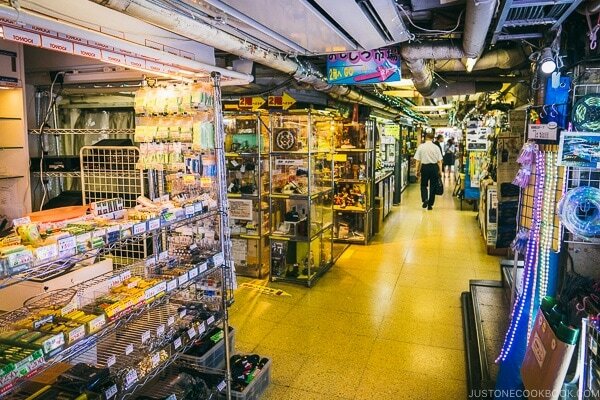 Besides the hobby shops and various retail stores on the main strip, there are older malls lined with small stalls each specializing in a specific type of electronics or hobby goods. 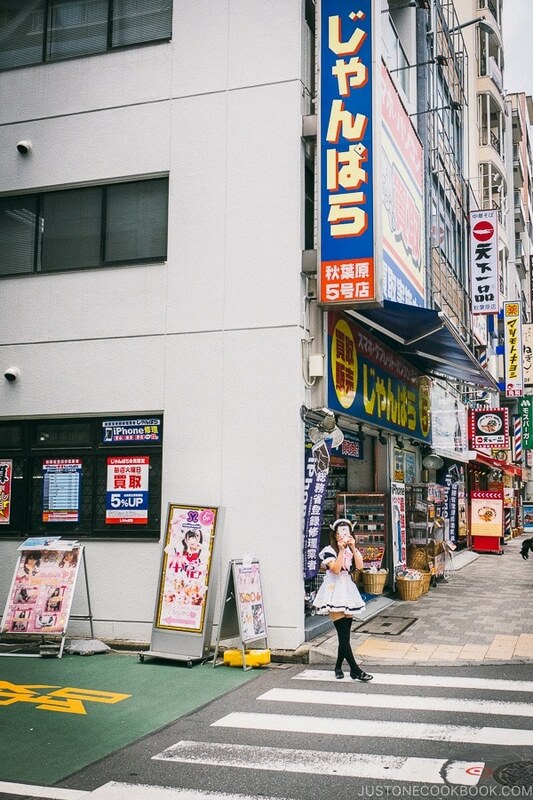 There are many differences for life in a big city between the US and Japan. One of the big differences is the number of video arcades available. 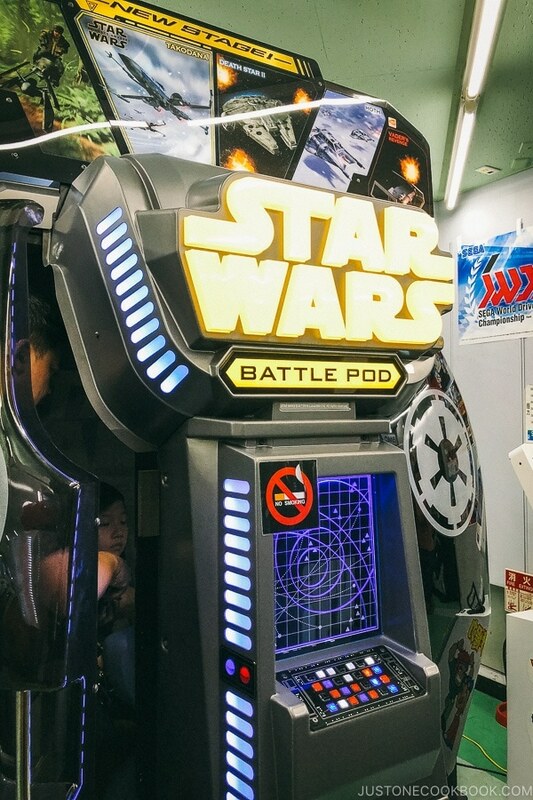 In Japan, there are large video arcades on the top floors of malls featuring the latest video games, casino machines, and UFO catchers. 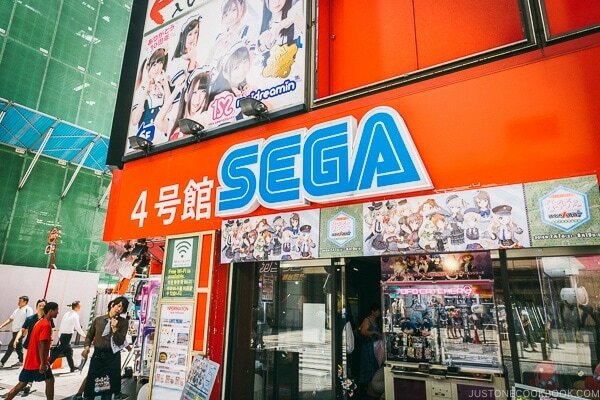 Akihabara takes this to a whole new level with entire building dedicated to arcades games including a few operated by SEGA. To rewards our children for being such good sports and going everywhere with us, we made a quick pit stop at one of the SEGA video arcade. 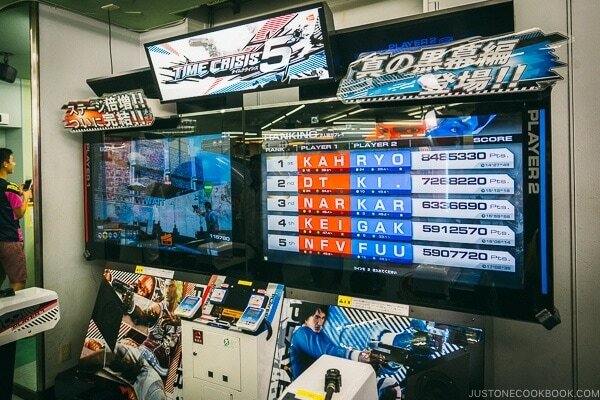 Time Crisis 5 arcade machines. 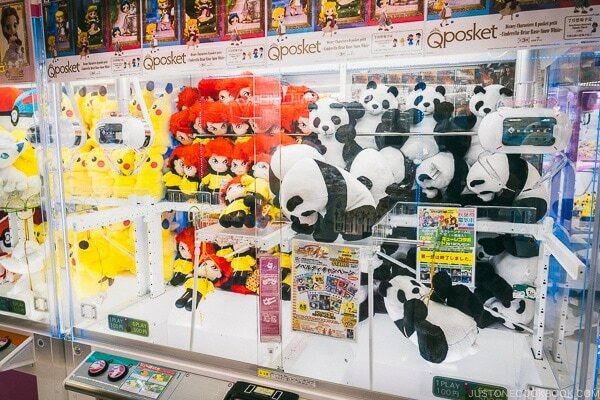 Inside of most arcades, there are also many UFO catcher machines which offer a range of prizes from oversized snacks to stuff animals. 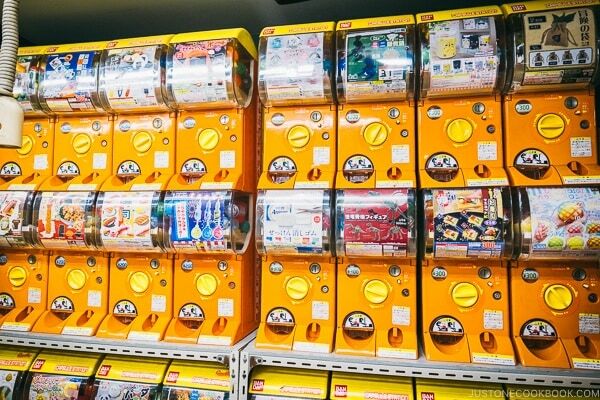 If you have been to Japan, you’ve probably seen Gachapon/Gashapon or the capsule vending machines. 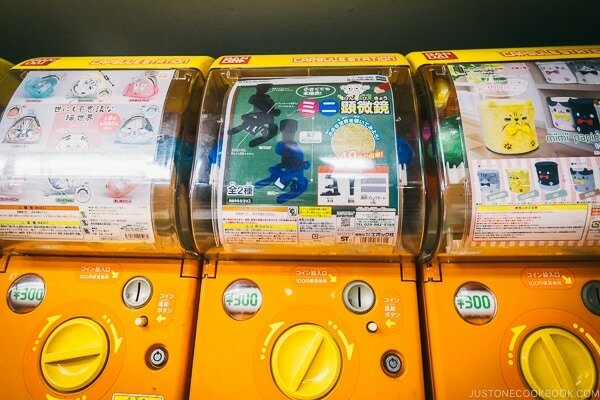 In case you’re not familiar, Gachapon is a vending machine where you put coins and twist the handlebar, and one of the random objects for the machine’s theme will come out. They used to be present in US supermarkets and pharmacy stores but you don’t see them as often anymore. 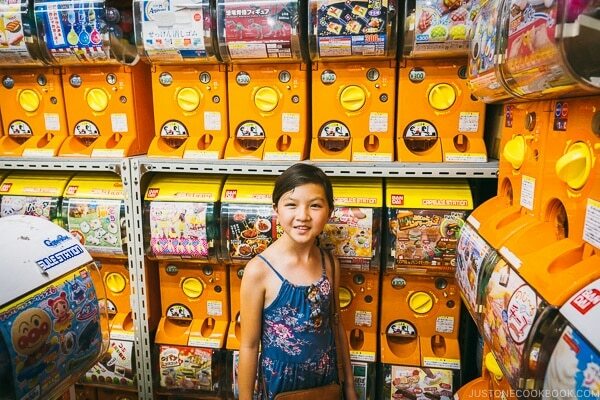 What’s so cool about Akihabara Gachapon Hall? 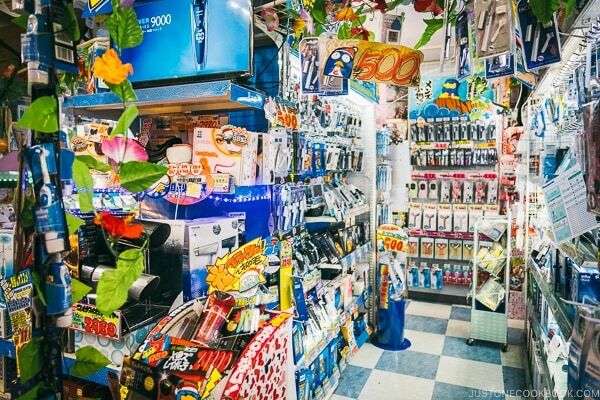 It has 400+ Gachapon machines in 1 place! 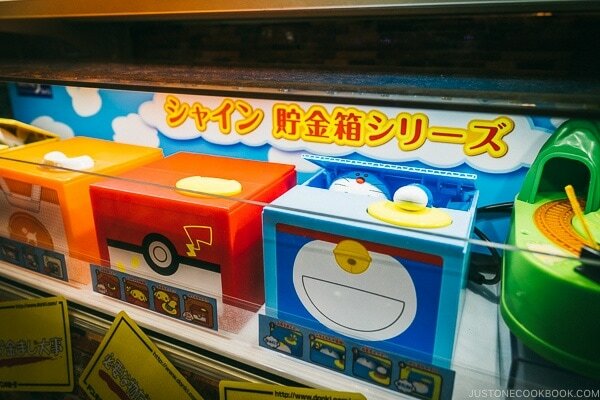 At Gachapon Hall, their vending machine gives random objects a whole new meaning. 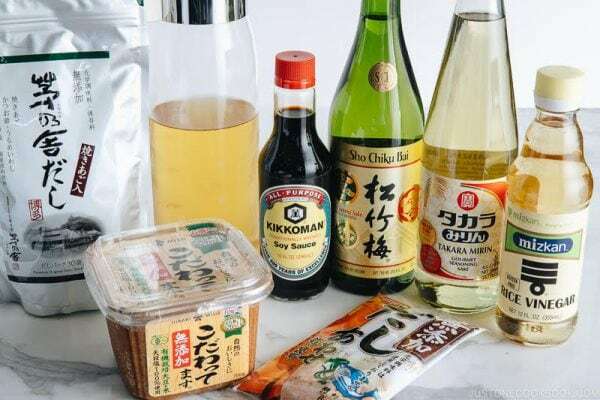 Among the more exotic gifts you can get, they include glow sticks, BBQ beef intestine phone straps, and miniature microscope just to name a few. 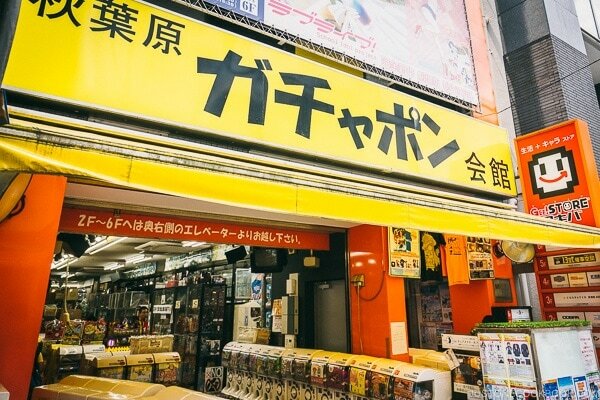 Speaking of stores and random goods, no experience to Japan is complete with visiting a Don Quijote megastore. 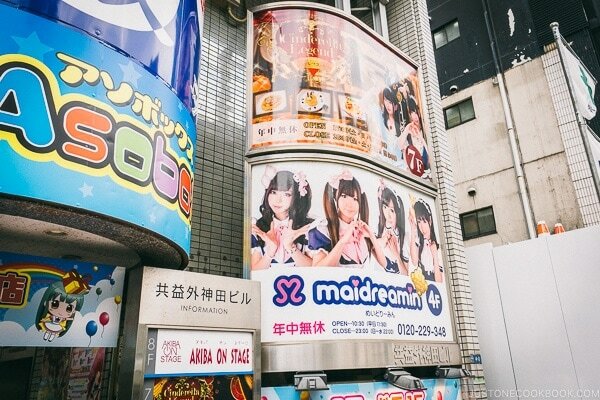 The one in Akihabara is 8 floors with 2 game floors, a maid cafe, and the AKB48 theater at the top. So what is Don Quijote? It’s like a general + electronics + shoe + bags + most random things discount store ever. Here are just some of things they carry below. 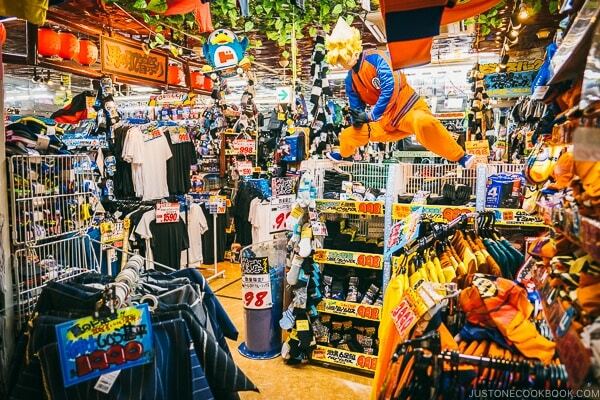 You can buy dragon ball outfits. 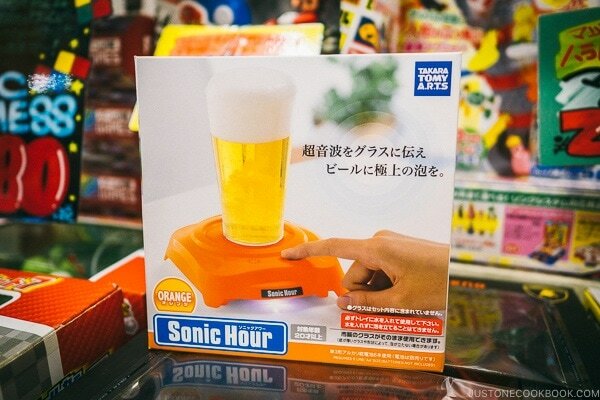 Beer supersonic foamer and onsen tamago maker. 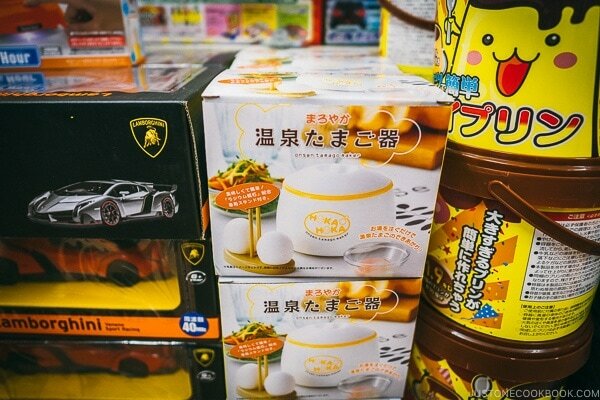 Besides clothing, toys, and random home goods, they also carry coin banks with characters that pop out and grab the coins with their arms, fireworks, and shampoo. 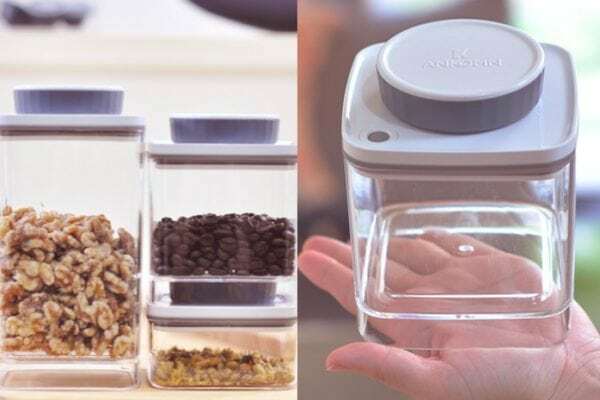 What’s fun and a bit frustrating at the same time is that the products aren’t really organized by categories so it’s a complete treasure hunt as you go inside to find what you’re looking for. 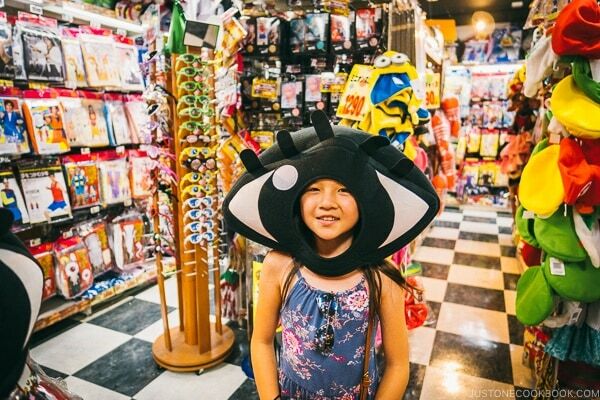 Our family had a blast this summer visiting many Don Quijote stores. 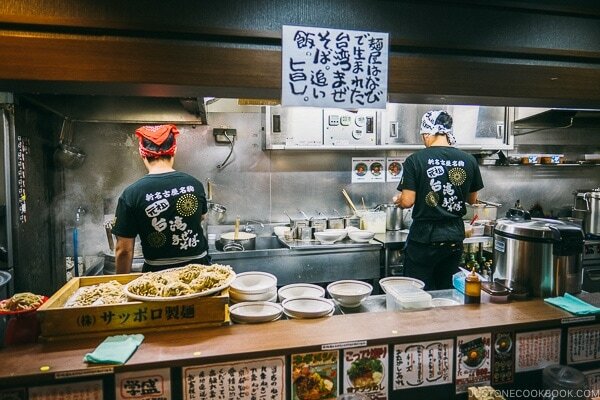 After browsing all morning, we got hungry so we stopped for delicious Taiwan Maze Soba (台湾まぜそば) at Menya Haruka. 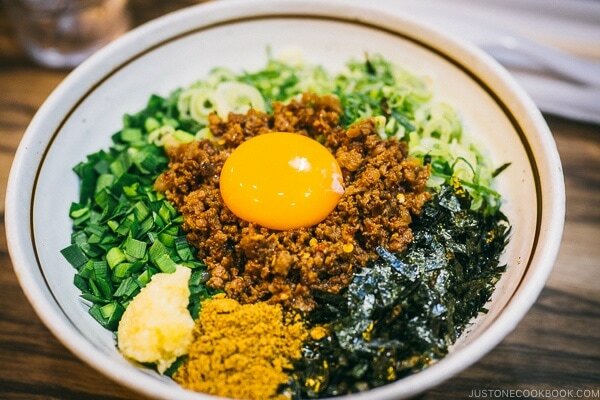 We previously tried Taiwan style Maze Soba in Nagoya where it was first invented but it wasn’t that good. 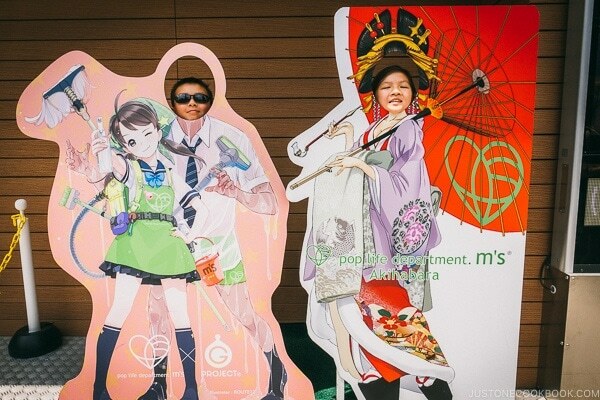 Since Menya Haruka is highly rated so we gave it another shot. The store is quite small and only fits about 20 patrons. Soon after we sat down, the noodles were served to us. 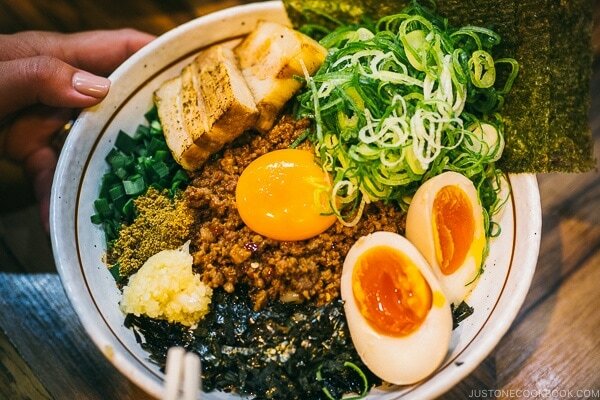 To eat the maze soba, you maze-ru (which means “mix” in Japanese) the noodles and toppings together to enjoy the noodle dish. It turned out to be a great choice; the noodles were fantastic and the sauce was super tasty. Just keep in mind it’s very filling and heavy, and the garlic flavor is really strong. 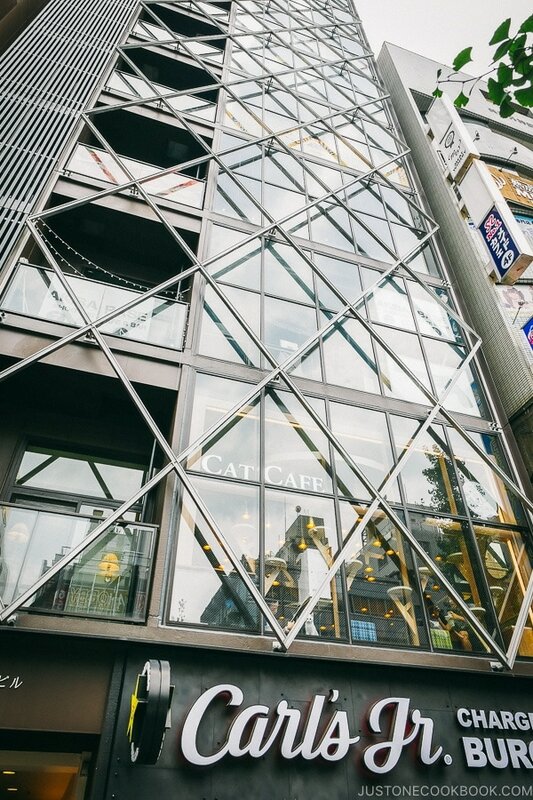 Lastly, we didn’t get a chance to do so but you can check out the several themed cafes in the area. 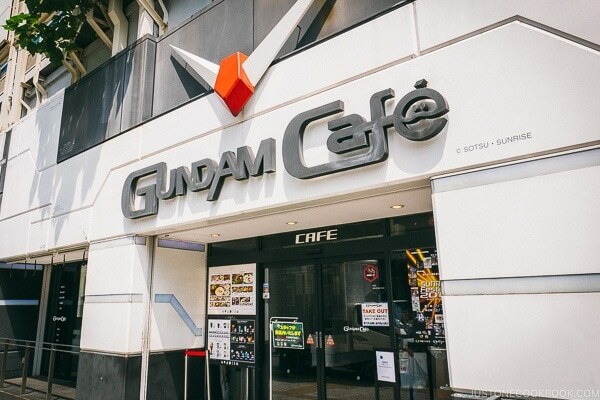 Akihabara is known for its themed cafes including Gundam Cafe, AKB48 Cafe, maid cafes, and animal cafes with cats and owls. 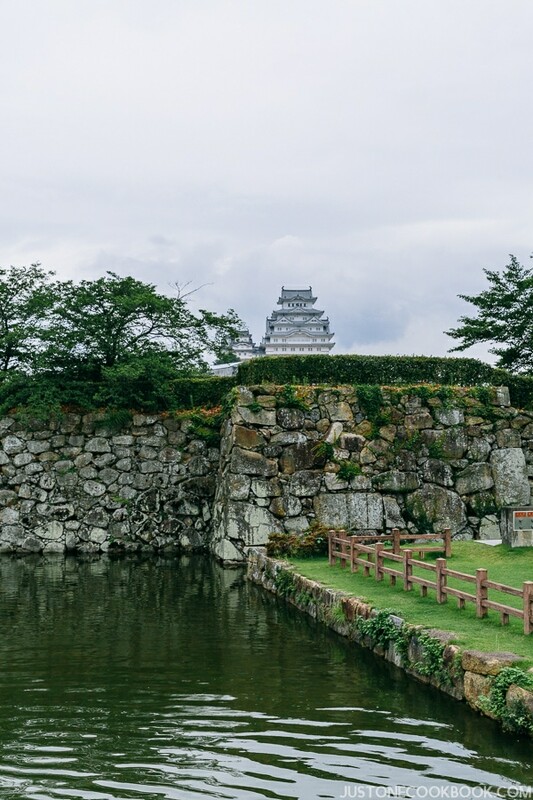 As always, thank you for reading our travel post. 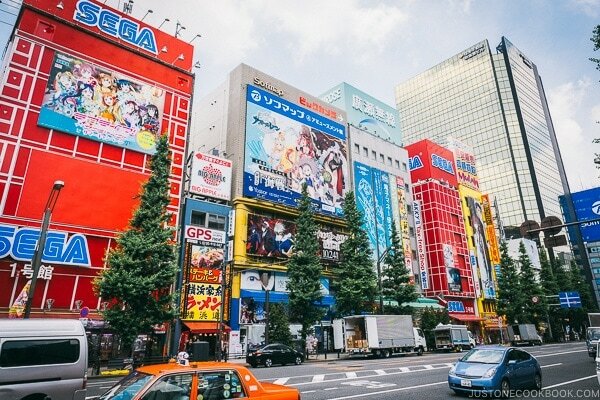 We hope you enjoyed traveling to Akihabara with us. 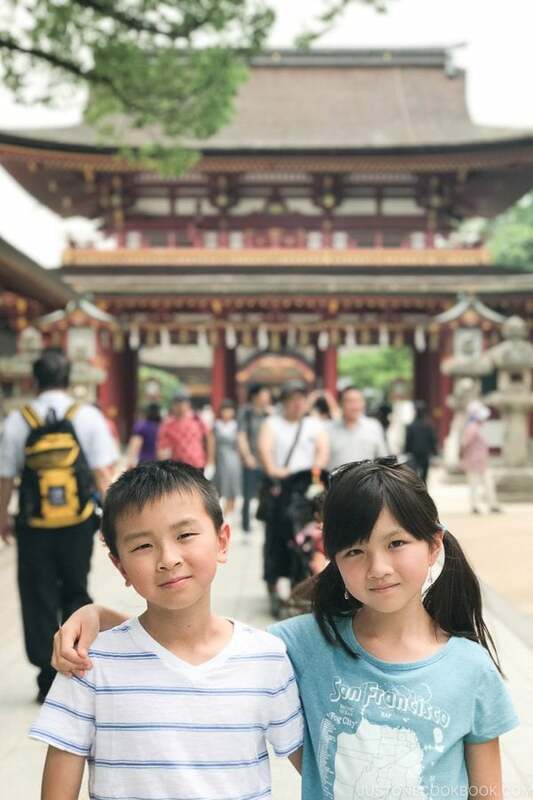 If you are interested in reading about other parts of Japan, check out the post below read about our other travel experiences Tokyo. 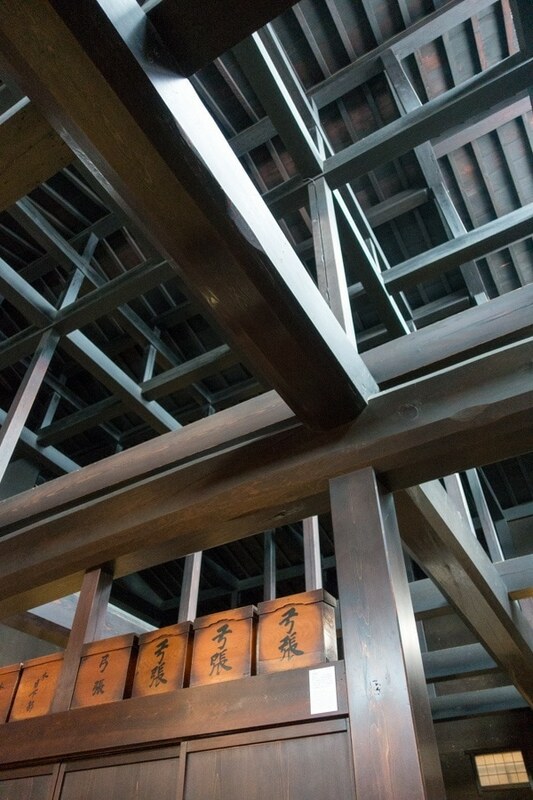 We’ll see you soon in our next travel post and tour the National Museums at Ueno. BBQ Beef Intestine phone straps. 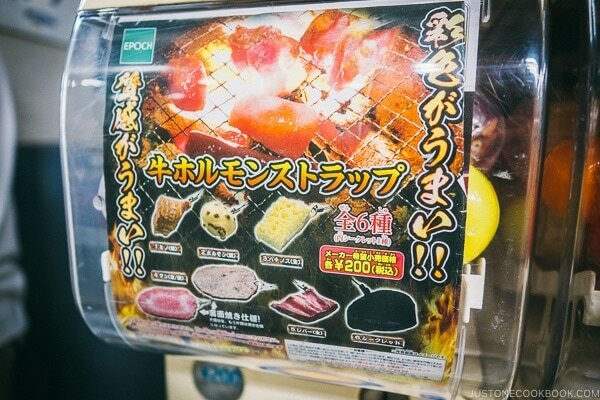 Sorry to freak you out, they are made of plastic but just in the shape of different beef intestines (https://www.justonecookbook.com/wp-content/uploads/2018/10/Akihabara-travel-guide-34-1160557.jpg). 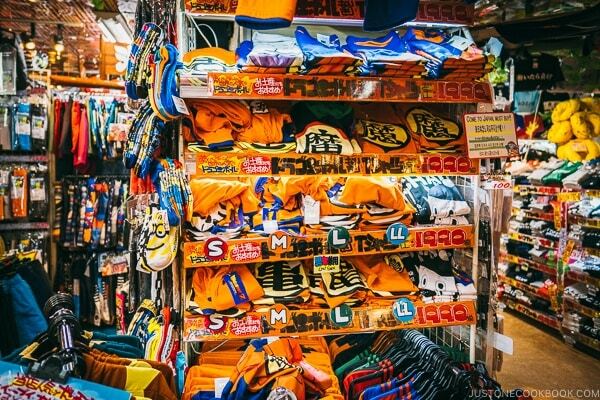 Yes, Akihabara is the destination if you love anime and manga and you could probably spend days there. 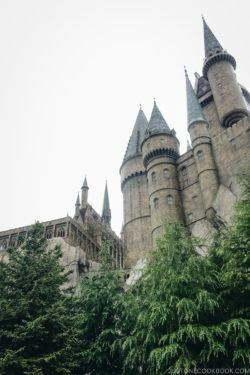 We hope you get to visit one day.